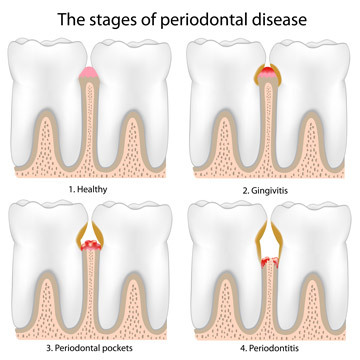 Sometimes gum disease will progress to a point that requires the intervention of a dentist. A common treatment plan in this case is the use of scaling and root planing. It is common to begin the treatment with a local anesthetic. The dentist will then use an instrument called a scaler which removes the plaque and tartar from underneath your gum line. Once the cleaning has been done, the root surfaces of your tooth will be planed and smoothed so that the gums will have an easier time reattaching to the teeth after use of the scaler. Some dentists may use antibiotic fibers in between your teeth and gums to encourage healing and lower the chances of infection after the cleaning. The dentist will remove the fibers approximately a week after he has done the cleaning. Daily flossing and brushing is a necessary part of avoiding gum disease. However, root planing and scaling is a wonderful way to deal with any gum disease that begins to develop. Usually, this treatment will eliminate the need for more serious treatment. Because of the anesthesia, your lips and gums may possibly be numb for several hours after your treatment. However, the use of the anesthesia should keep you from suffering any pain or discomfort. You will want to follow up a planing and scaling treatment with consistent brushing and flossing to maintain healthy teeth and gums.